About | Christel And Heiberger Builders Inc.
With over 34 years experience we can guide you from start to finish! Excellence is in the details … We guide you from start to finish! Since 1982 Christel & Heiberger Builders has been designing and building quality custom homes and completing stunning renovations for homeowners who expect nothing short of spectacular in return for their investment. Partners Glenn Christel and Tom Heiberger oversee a talented and personable team of highly skilled craftsmen and dedicated building partners who work together to complete your new home or remodeling project with a level of quality and craftsmanship far beyond your expectations. 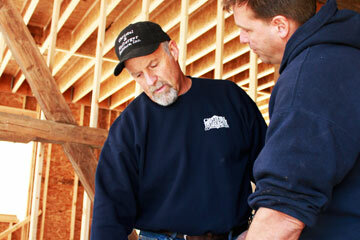 Building or renovating a home can be one of the most significant investments of your lifetime. Once you’ve made this important lifestyle decision, you won’t want to place the project in the hands of just any contractor. 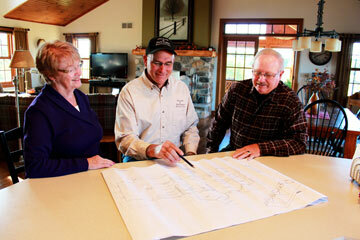 Christel & Heiberger Builders has earned a coveted reputation as one of the most trusted custom builders in Northeast Wisconsin because of their absolute commitment to the highest quality design and craftsmanship for every project, no matter how large or small, and doing whatever it takes to ensure that each and every customer walks away delighted with the work we have done for them. Christel & Heiberger Builders is centrally located in the town of New Holstein, Wisconsin, approximately 20-30 minutes from the communities of Appleton, Manitowoc, Sheboygan, Plymouth and Fond du Lac, and 40 minutes south of Green Bay. Our service area varies dependent on the size and complexity of the project. Much of our work is in Calumet, Sheboygan, and the surrounding counties of Brown, Outagamie, Kewaunee, Winnebago, Manitowoc, Fond du Lac, Washington and Ozaukee. We have served customers as far north as Upper Michigan and as far south as Milwaukee. We are deeply honored to hear from so many delighted customers, and to have our work recognized numerous times by our trade association peers. Please visit our customer testimonials page to read comments shared by many of our happy customers. The Mid-Shores Home Builders Association “Builder of the Year” is awarded based on votes from fellow association members, who consider community involvement and service in addition to the quality of the builder’s work and level of customer satisfaction. 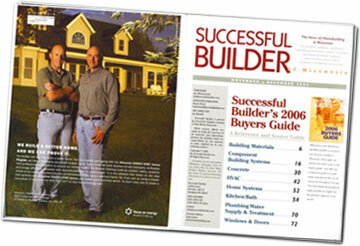 Christel & Heiberger Builders has been honored with this award five times in the last thirteen years. The recipient of the MSHBA Annual Parade of Homes “People’s Choice Award” award has been determined by popular vote of visitors to the Parade of Homes. Christel & Heiberger Builders has been honored as the recipient of this award seven times since 2003. The honor was awarded through 2012.